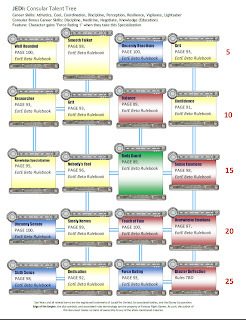 One of the systems in the Edge of the Empire game designed to help facilitate role playing is the Obligation system. Designed by long-time Star Wars RPG writer Sterling Hershey, the Obligation system replicates life's nasty habit of rearing its ugly head at inopportune times, and the increased stress it can cause your character (mechanically represented by a temporary reduction to your character's Strain Threshold). The Obligation system throws a bit of chaos at the character, as past troubles and responsibilities that are still hanging over your character's head manifest and demand part of your character's attention. While the Jedi Career I've written up doesn't fit well into the typical era for Edge of the Empire, the Obligation system is an interesting and potentially fun system to use, regardless of the time-frame of the campaign. Jedi have all kinds of opportunities and options for starting Obligations, how to pay off and reduce obligations, and how they can gain additional obligations in play (and will want to!). I'm sure that the soldiers and spies in Age of Rebellion will have a different system that replaces Obligation for that core book (due out sometime in 2014), and that Jedi will have something else entirely when Force and Destiny is released in 2015. Until then, gamemasters who want to have Jedi in their game but don't want to miss out on the interesting options the Obligation system offers can utilize the following concepts and Obligation ideas. According to the Star Wars Essential Atlas, the galaxy is 120,000 light-years across. There are over 400 billion stars, with 180 billion star systems. 10 percent of those systems developed life, and of those about 20 million developed sentient life. During the height of the Galactic Empire, there were an estimated 100 quadrillion beings; and those are just on Imperial controlled worlds. There could easily be five to ten times that number of beings in the galaxy, hidden in the Unknown Regions. I'm going to try some math here. It's not my strongest suit, but I think I got a handle on what I'm trying to express for a moment. Let's focus on the number "100 quadrillion beings". My mind can't even conceive that number and what it entails. But to maintain the peace and stability of the Republic (predecessor to the Empire), the Jedi Order was supposed to serve a similarly mind-bogglingly-large populace. Reportedly with only ten thousand trained Jedi Knights and Masters, that's one Jedi per one hundred trillion beings. One Jedi to keep the peace and maintain Republic justice for the population of 14,285 Earths (assuming 7 billion people per Earth). That sounds like one hefty obligation to me, doesn't it? Think about it; you're a Jedi Knight, on a mission trying to recover a powerful dark side relic from Darth Adnosium when you get a call from the Republic Ambassador to the nearby Warzalot system, who's planets are a hair away from nuclear war, who asks if you wouldn't mind dropping everything to swing on by and stop the mass destruction because the Ambassador is throwing a huge party this weekend and baridium mushroom clouds weren't on his decoration list. Okay, so that's a little extreme an example but you get the idea. Plus it illustrates how a Jedi can be pulled off his game by the obligations he has. He's got a responsibility to the Order, and to the Republic, and because there are typically so few Jedi around he could be called upon quite a bit. So what obligations could a Jedi have? Which ones fit a Jedi character in an Era where Darth Vader hasn't reduced the population of Jedi Knights to a couple handfuls? The correct answer is "any of them", but I will admit that a few stand out more than others. Possibly the most stand-out obligation for a Jedi is Responsibility. Dutybound is another easy fit for Jedi. Responsibility to the Republic to keep the peace. Dutybound to the Jedi Order and the Jedi Code. What's not so simple is to figure out exactly what a 15 point Responsibility or a 5 point Dutybound obligation look like. Over on his blog, Sterling Hershey gave us some wonderful insight a few weeks back on a value explination of each obligation. It's given me several ideas as to how to work in any Obligation to a Jedi character. 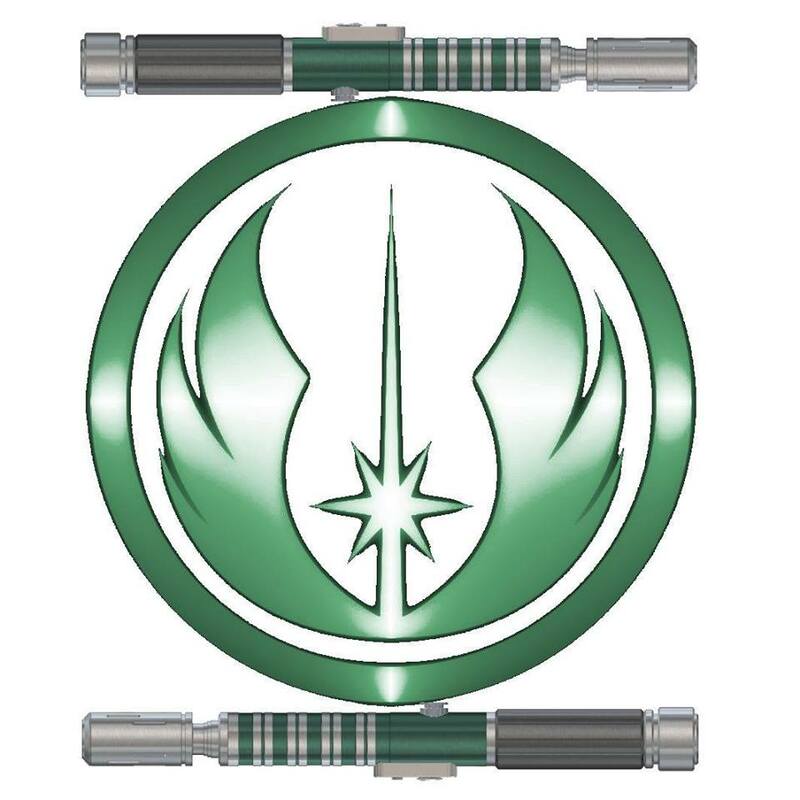 Dutybound: Looking at Sterling's post, Dutybound would be a good obligation to cover the Jedi's devotion to the Jedi Order, or to the Jedi Code. A 5-point obligation could simply be your character's base-line commitment to the Jedi Order. This could even be the "permanent" 5-point obligation that cannot be gotten rid of. It certainly would make a lot of sense. A 15-point commitment (or higher) means you're devoted to the Jedi; the Code is your life, the Order is your family, and you strictly adhere to its tenets. This commitment manifests itself by your master, the Jedi Council, or other political entities calling on you frequently to serve in the interests of the Jedi and the Republic. You might not want to buy down this Obligation, except for the fact that the Order is demanding on your time and your adventures with the other party. Reducing this obligation may involve taking on important missions for the Order and being recognized for your actions by the grant of more autonomy. Another take on this obligation is that you're not as good a Jedi as you should be. Maybe you have anger management issues, or you're a little too flirtatious with your preferred gender. In those cases, this obligation is the control the Order places upon you, and is constantly calling on you to keep tabs on your actions and to keep you in line. Reducing this obligation means you've shown the Jedi Order that you're improving your questionable behaviors. Responsibility: This obligation usually translates into certain tasks or duties the Jedi performs for the Order. Maybe they're assigned to a specific planet, system, or sector. They could be dedicated investigators, and are directed to look into matters by the Council. Maybe they're experts in a certain field, and teach classes to Jedi Initiates. They could even be caretakers for certain individuals or artifacts. Here's an interesting take on the Responsibility obligation for a more experienced Jedi; being assigned a Padawan. We have seen time and time again when a Padawan Learner has cause stress and frustration to their master with their actions. You start with a huge obligation, then as you train your learner and they get more and more skilled, you gradually pay down your obligation. The payoff comes when the Padawan becomes a fully trained Jedi Knight, and your Jedi is granted the rank of Jedi Master. It's not an immediate benefit for taking on the obligation; it's an investment for later. Crime: You may think this is one of the more difficult obligations for a Jedi to have, but Jedi commit crimes all the time; at least, in some people's eyes. Jedi are given a certain level of autonomy throughout the galaxy, but there are still local laws that a Jedi may break in the course of their mission. It's remarkable the number of speeders that Jedi "commandeer" to chase a villain. Could be a nice 5-point Criminal obligation there. Certain governments or law enforcement agencies may hold a grudge against the Jedi, and keep active warrants for their arrest even if they can't actually get to the Jedi. Perhaps a Jedi was on record for breaking and entering a few times, or caused significant collateral damage while on a mission. While statues make nice objects to use with the Move Force power, the public tends to get riled up when their monuments are used as projectiles (a nice 10-point Obligation there). In some cases, Jedi are required to kill in self defense, but if the person killed had powerful friends, they may issue active warrants against the Jedi and actively try to arrest or extradite the Jedi for trial. Alternately, the Jedi may not have killed in self-defense, and have a more murderous angle to his crime. I'd make crimes related to the death of another being worth a 15-point obligation, especially if the victim was "connected". Paying down this Obligation means the Jedi is taking active steps to make reparations, or working with the Jedi Order to get the charges cleared or dropped. Taking that route might turn the Crime obligation into a Responsibility one. Oath: Jedi make oaths all the time; to the Order, to the Republic, but to me those fit better into other obligations. This sort of obligation is the form of a promise. Perhaps you gave your word to protect someone, or to look after the child of an old friend. Maybe you witnessed a crime, and have vowed to track down the perpetrator no matter what. Maybe you even got married in secret, and are trying to keep that oath from coming to light (this might be a good one to pair with another obligation, like Dutybound or even Blackmail). I think the best example of the Oath obligation is the one Obi-Wan assumed to train Anakin. The "dying master" vow is a hefty obligation to take on. I'd have saddled Obi-Wan with a nice 15-point obligation for that one, simply because I as the Game Master would know that training Anakin wasn't going to be easy. Family: Family can be pretty abstract; it doesn't have to be your literal kith and kin. 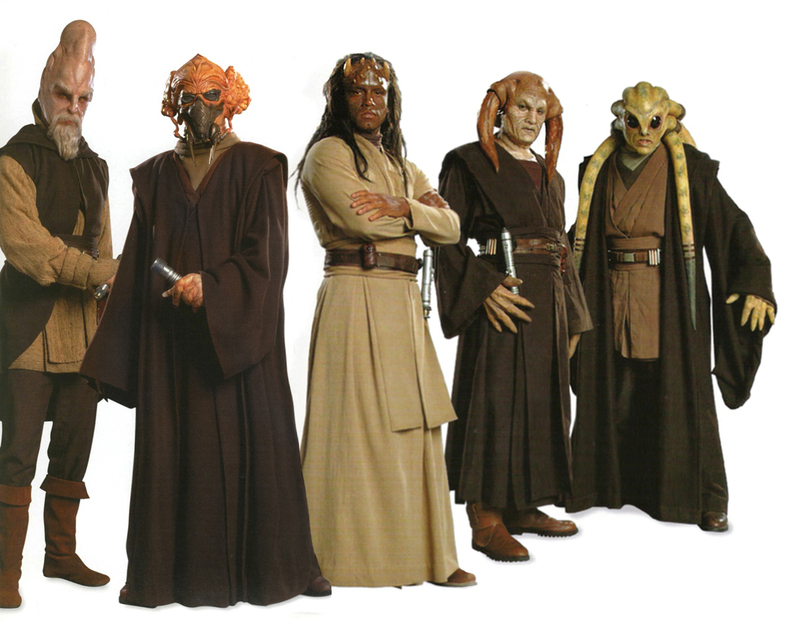 The Jedi Order could certainly be a family to the Jedi character. For that, you're not really dedicated to the oaths and responsibilities of the Jedi, you're committed to your fellow Jedi "brothers" and "sisters", and will do what you can to help them in any means. That, or your peers are constantly judging you, pushing you to do better, and do more. Of course, a Family obligation could be the more literal one. It could be you're keeping your family a secret (like with the Oath obligation example, above) or your old family is exerting their influence on your life. Perhaps you're the heir to a noble family, and they want you back to assume your place, or they contact you because they need you to rescue another member of the family. It could be something like being a role-model for a sibling, or maybe they need an organ donor for a transplant for a sick relative. These are all good 5- to 10-point obligations. Obsession: I really like the potential for a Jedi to have the Obsession obligation. 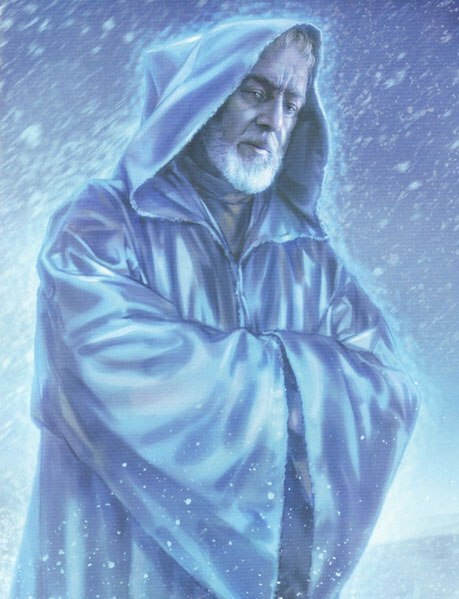 What interests me is that this obligation could lead the Jedi to the Dark side, as an unhealthy focus on a person or thing can open a doorway leading to the fall of the Jedi. The Jedi could be obsessed with the Force, and are marveled at its power and abilities. They use the Force to solve all their problems, even trivial or mundane ones. Maybe they're focused on a person, like a Jedi Master, and work to be like them (or better than them). A Jedi, or anyone really, who isn't mindful of their emotions can turn love into obsession. This can cause numerous problems. They think about their object of affection often, sometimes distracting them and their allies with how the Jedi is carrying on. For a Jedi, it's has an extra level of danger because it could cause the Jedi to take actions that are not harmonious with the Force, actions that are of the Dark side. 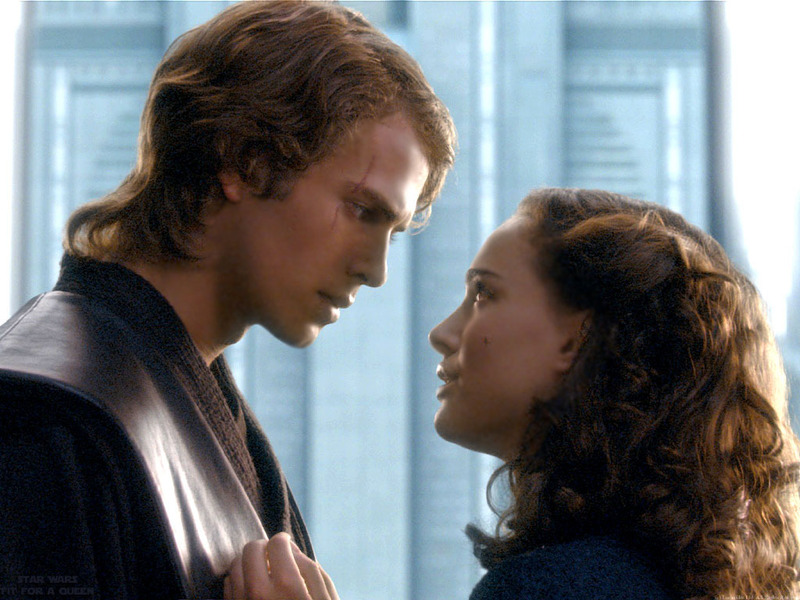 A Jedi with an obsession like Anakin had for Padme would definitely be a 15-point Obligation. Anakin didn't really pay off this obligation as much as he traded a large part of it for an Oath or Family obligation. Or maybe it was a Betrayal obligation? This "new update every week" thing is tricky. It's certainly demanding on my free time (whatever that is). It's not just that I'm typing up a blog post, I actually have to do something that's worthy of doing a blog post about each week. Be it custom RPG work, costuming, or campaign stories; I need to have spent the time to do something Star Wars related in the first place to come here and tell you all about it. I guess that just leaves one thing to write about. 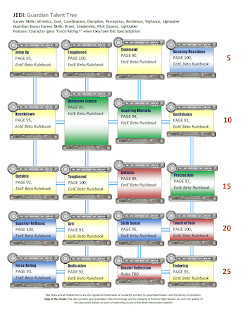 Time to stop going over theorycraft and present to the Gamer Nation my custom work on a Jedi Career and it's Specializations for use in Fantasy Flight Games' Edge of the Empire setting. That's right kids, it's Crunch Time, and I'm not referring to a deadline! ﻿ ﻿So after several weeks of work, the three talent trees came together into what I have presented below. These trees are designed with the spirit of the Edge of the Empire system in mind while utilizing as many existing talents as possible. The talents presented in the book are solid, and offer many options for use within a Jedi Career. The only talent that is homebrewed and that requires explanation outside of the Beta Rulebook is the Blaster Deflection talent. There are some great discussions and great options for how to use your lightsaber to deflect blaster bolts over on the D20 Radio Forums. I know the Jedi need Blaster Deflection at some point, so I placed it as a bottom row talent in all specializations. As far as the specific rules for the talent's mechanics go; head on over to the forums and find a version of the talent that you like (or more likely, that the GM likes). Once someone at Fantasy Flight posts something that's more official (unlikely until 2015), or a fan posts a web-published set of rules that I like, I'll make the changes and post it up here. Until then, it's vague to allow for your playstyle. 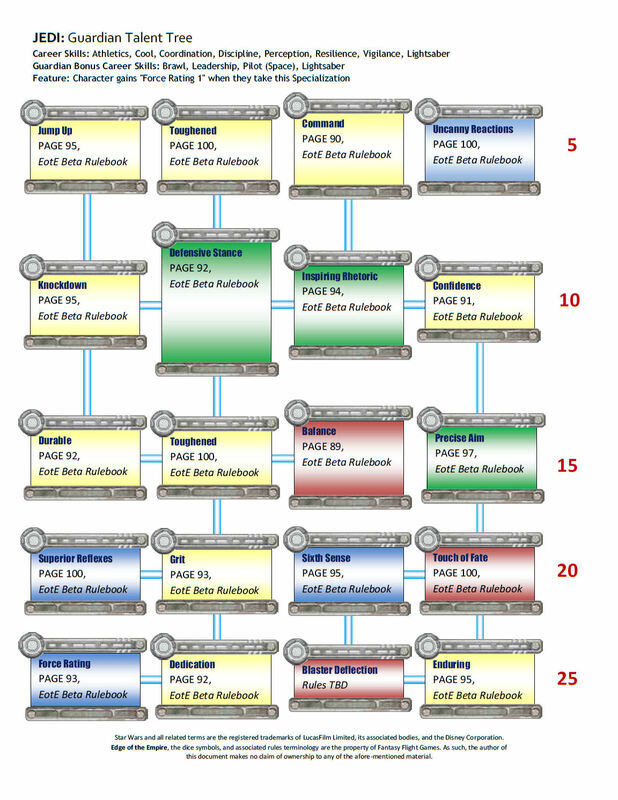 You'll also notice the talent trees make references to page numbers in the Beta Rulebook. Sorry; at this time you'll need the book by Fantasy Flight Games to know specifically what those talents do. I'll update these trees further once the Core Rulebook is released later this year with new page numbers. As a guide, Yellow talents are Passive abilities, Green talents are Active abilities, Blue talents are Passive Force abilities, and Crimson Talents are Active Force abilities. Passives are on all the time, Actives require some expenditure to initiate. Force talents are only usable by those beings with Force ratings, which all specializations gain once they buy into them. Concerning Force ratings; each Specialization grants the character Force Rating 1 when taken. This is to allow someone from outside the Jedi Career to buy into the specialization, just as when someone takes the Force Exile Specialization in the Beta Rulebook they gain a Force Rating. Keep in mind that you get "Force Rating 1". If you already have a Force Rating when you buy a new Jedi Specialization, you use the better rating. 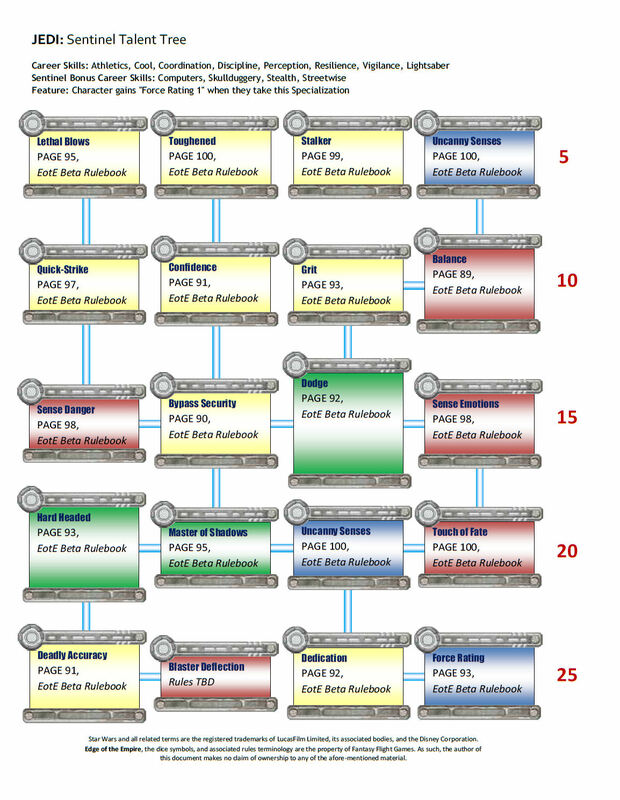 You don't add an additional +1 to your Force Rating by buying access to the Specialization. That's what the Force Rating talents are for. ﻿﻿﻿﻿﻿﻿﻿﻿I talked about this tree last time I went over the Jedi career, but now I go into some detail about my choices, and officially share my progress. The first row gives you some good introductory Talents; Jump Up might be a steal for 5 xp, but that can be explained as using the Force to enhance your prowess at getting up from prone.﻿ Talents that grant extra Wound points, skill with motivating others, and a bonus to your initiative rolls seem like good places to start for me. The next tier adds some fun talents; Knockdown gives you something else to do with your Triumphs. Normally, knocking someone prone is only possible if they roll three Threats while attacking you. Now you get to choose to knock them prone and get bonuses to your melee attacks. Inspiring Rhetoric and Confidence reinforce the positive influence a charismatic Jedi can have on the field, or in any endeavor. ﻿As an aside, all three Specializations get Confidence, and at the second tier. The only difference is that the other two classes go right to it, where for Guardians it's a branch off from another second tier talent. Third tier we get more survival Talents for the Guardian, and a solid talent for attack rolls with Precise Aim. Fourth tier gives us more Force talents, increasing the Jedi's defense in melee and ranged attacks, as well as allowing the Force to influence the Jedi in potent ways. Finally, the fifth tier gives the Guardian options to increase to their Force Rating, Soak value, and one Characteristic, as well as access to the aforementioned Blaster Deflection talent. ﻿﻿﻿﻿Right now, the only way to get to Blaster Deflection, Sixth Sense, and Touch of Fate is to take Inspiring Rhetoric and Confidence up at tier two. I'm tempted to give another branch to the tree between Precise Aim and Balance. However, I do like the split between the two sides of the tree down at tiers four and five, making the Jedi focus on increasing his Characteristics and melee prowess over ranged defense. Another possible branch could be swapping Force Rating with Dedication, and Grit with Superior Reflexes, then linking Grit to Durable instead of Toughened. 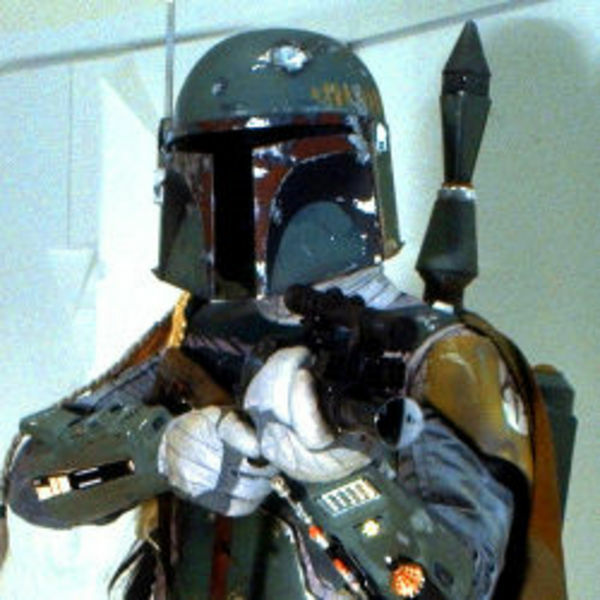 I could then have a bridge from Force Rating to Blaster Deflection. Hmmm...I might make that change. I'll let you know if I do. Next up is the Consular, built as a combination of the Politico, the Scholar, and the Force Exile. 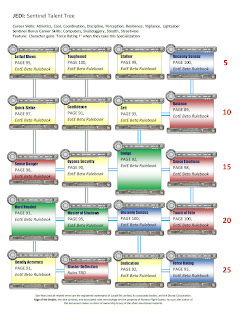 This was actually the hardest tree to make, because Consulars have traditionally been a class of Jedi I've shied away from. I prefer the "in your face" physical nature of Jedi Guardians, and the utility of Jedi Shadows. "Talky Jedi" have never really appealed to be, but I can certainly appreciate the role they fill in the universe and in the PC party. 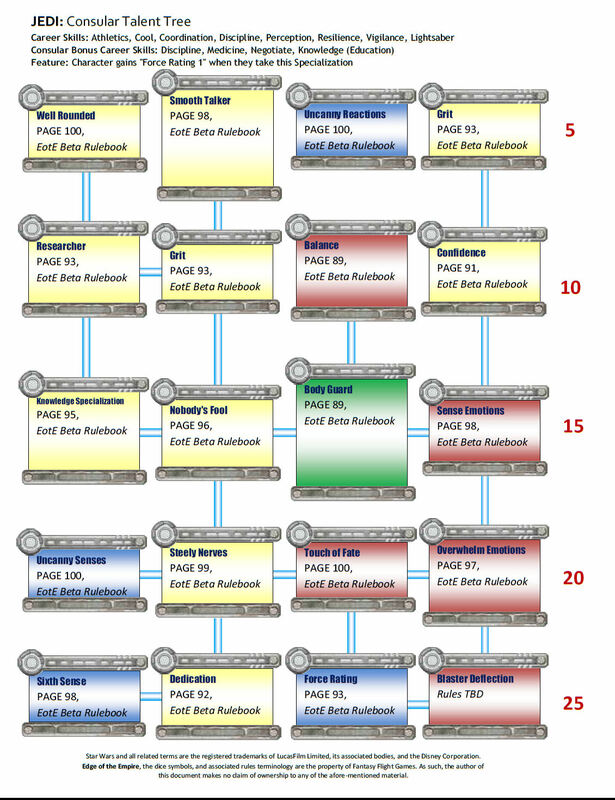 To that end, I tried to put together a solid tree of talents for the Consular, as well as a good spread of Skill choices for them. I tried to make something that would be fun to play, even for a guy like me. ﻿Consulars first tier skills give them additional access to skills as Career skills, greater proficiency with a social skill, quick reflexes for initiative, and an increased Strain Threshold to help them with the migraines they are likely to get during difficult negotiations. Tier two gives a lot of utility and strengthens their resilience; Consulars can snag Researcher to make Knowledge checks easier, Confidence to bolster their resistance to fear effects, and another rank of Grit to increase their Strain Threshold. Balance is in this region too, but to buy it you have to go down to tier three, and move laterally, and move back up the chart to purchase it. Tier three is where the Consular can start to specialize, literally. Knowledge Specialization allows them to choose one area of Knowledge to get increased effects on. I gave them access to Nobody's Fool because Consulars tend to be very canny when it comes to social checks, and have an innate resistance to anyone trying to put one over on them, even without the Force as their ally. Sense Emotions is the flip side; giving the Jedi a bonus to similar social checks through insight in the Force. Body Guard may seem like an odd choice, but I think it's very fitting for a Consular. The role of the Jedi is to protect, and often times Jedi Consulars are near folks who have a habit of having others wanting them dead. Tier four gives the Consular a lot of Force abilities; Uncanny Senses to notice danger, Touch of Fate to be strong in the Force and give a boost to a critical check, and Overwhelm Emotions to add a roundhouse kick to the social punch of the Sense Emotions talent. Tier five you find what you'd expect at this point; Dedication, Force Rating, and Blaster Deflection. I also added Sixth Sense to the list to help their survivability. I could have tried to work in some Doctor talents into the tree, but I feel that if a Jedi wants to specialize in being a Jedi Healer, they would branch out and pick up the Doctor specialization, under the Colonist Career. Jedi Healers actually aren't that common in the Expanded Universe, so I feel my design choice reflects that. Just like the Guardian tree, I can see some edits I may want to make to the Consular. I can see linking Sixth Sense to Uncanny Senses. I can see swapping Sixth Sense with Force Rating, but that makes that branch of the tree too good. Adding a Setback die to the attacker's difficulty, on top of whatever version of Blaster Deflection grants would be a little much, certainly not without spending the XP needed to get it through the other branch. I think this tree will remain like this for some time, though. ﻿While I enjoyed creating the Sentinel tree, it also caused me some problems. Sentinels in the Expanded Universe are presented in such a wide variety of ways. Hunters, assassins (of sorts), detectives, infiltrators; if you take every aspect of the Sentinels as presented, they'd be a career of their own. For this I decided it was best to go back to where it began, with the original Knights of the Old Republic video game. There, the Sentinels were the Jedi-analogue to Rogues. They had a lot of sneaky tricks, and a lot of skills. I took inspiration for the Sentinel from Scoundrels and Thieves, and from the Assassin and Marauder trees (ironic, given that the Sentinel's Sith counterpart in the Old Republic MMO is the "Sith Marauder"). Tier one you get a solid base with Lethal Blows, Toughened, Stalker, and Uncanny Senses. Second tier brings in some nasty tricks, with Quick Strike, Confidence, Grit, and Balance. Of the three Specializations, Sentinels get Balance easiest. They're often presented as being on their own, and I can see them needing to focus on self-reliance a lot. In tier three we have Sense Danger, Bypass Security, Dodge, and Sense Emotions. This is the first of the infiltration and investigation tiers. Tier four continues this, with Hard Headed, Master of Shadows, Uncanny Senses, and Touch of Fate. Finally, we see Dedication, Blaster Deflection, and Force Rating at the bottom, with the talent Deadly Accuracy included to help the Sentinel end combat quickly. I'll admit, the addition of Deadly Accuracy may be my nod to the Jedi Sentinel as presented in The Old Republic. It's a nice boost to the Jedi's DPS. I almost wonder if I should remove the link between Sense Danger and Bypass Security. It's an odd link. Maybe change it to link with Hard Headed instead. Unlike the other two trees, I'm pretty happy with how the bottom of the tree branches out, so I don't think there will be any changes there. If you look on the Fantasy Flight Games boards, and even a little bit on the D20 Radio boards, there's a polarizing event occurring when you talk about Jedi in Edge of the Empire. Some folks are mad at FFG for even thinking about releasing a Star Wars RPG without a playable Jedi class in it. Some folks feel it's perfect, that given the focus of the game's setting the lack of a Jedi career is a welcome nod to the dearth of Jedi during the Rebellion Era after the Battle of Yavin. What gets me is that folks are so passionate about their stances on the issue that they're willing to let tempers flare and attack each other personally about it. Or ridicule the other side for deigning to think anything but the way they know the game should be played. These people are so obsessed with their views that they refuse anyone else's point of view, even folks actually working on the game. Here's my stance; I get why FFG made the choice they did for Edge of the Empire. I really do. For me, I want the option for Jedi, because the campaign I want to play does not take place during the Rebellion Era. I don't like limitations or restrictions to my hobbies. It hurt me to wait two years for the official book for the Legacy Era for SAGA Edition, but I did it and I still ran my Legacy Era campaign. How did I accomplish this? By making it up, writing and fudging with what I had until I had something I felt I could use until the official rules for Legacy Era ships, droids, and classes came along. I didn't have to wait beofre I could play in the Legacy Era because I went out and did what I felt I needed to do to move forward. No one can tell me not to, and I never told anyone they had to do it my way either. It's just a set of rules. So review these trees at your own discretion, and for your own enjoyment. I'm likely to update them as official rules are released and as my own playtesting occurs (if it occurs). Use them for your games and let me know what you find. Play them as you see fit. FFG, LFL, nor Disney will send the Rules Police to you to tell you different. Unless you try to make money with it, then...hey, you're on your own. In any case, the Force will be with your PCs, always. Changing it up this week to talk about the other intended subject for this blog; costuming. More specifically, costume prop-making. I'm fascinated by the construction of props and do-dads that help round out a perfect costume. This time around, I wanted to build something unique and personal; my own lightsaber. I may have a problem...I need more Blues. 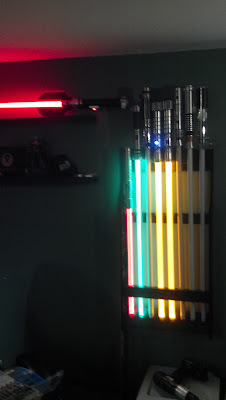 I own a lot of lightsabers. Well, okay, maybe not a lot by some standards of folks in this hobby, but certainly more than your average Star Wars Nerd. Eight of them sit on a rack behind my head, one on a stand on the shelf, and a few more tucked in a corner of my office. About half are FX Sabers from Master Replicas. Every year for several years my folks would get me another 'saber for Christmas. 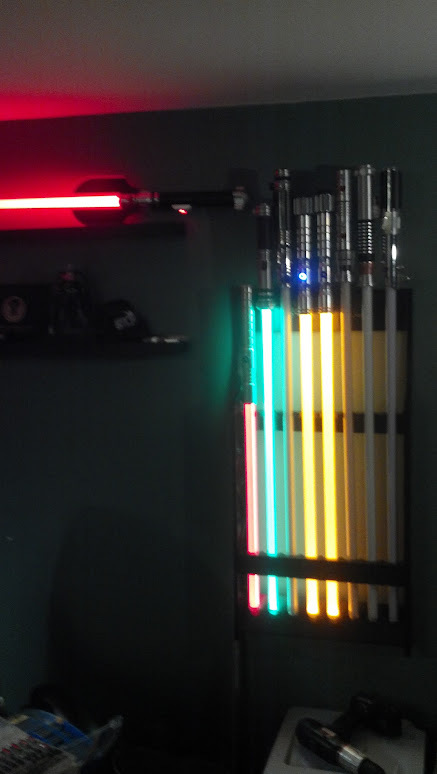 The rest are mostly from Ultrasabers, one of the more public saber-building company out there. All these are nice and all, and are really cool, but ever since I found the Custom Saber Shop, I've wanted to get parts and build my own saber. They have hundreds of parts that can go together in millions of combinations. Kinda like Legos, but in T-6 aircraft aluminum. Over on the Custom Saber Shop (or TCSS), they have a system of parts called the "Modular Hilt System"; a series of main bodies, pommels, blade holders, and accent parts. You can even get some parts powder-coated. Lit blade activation switches. Sound boards. 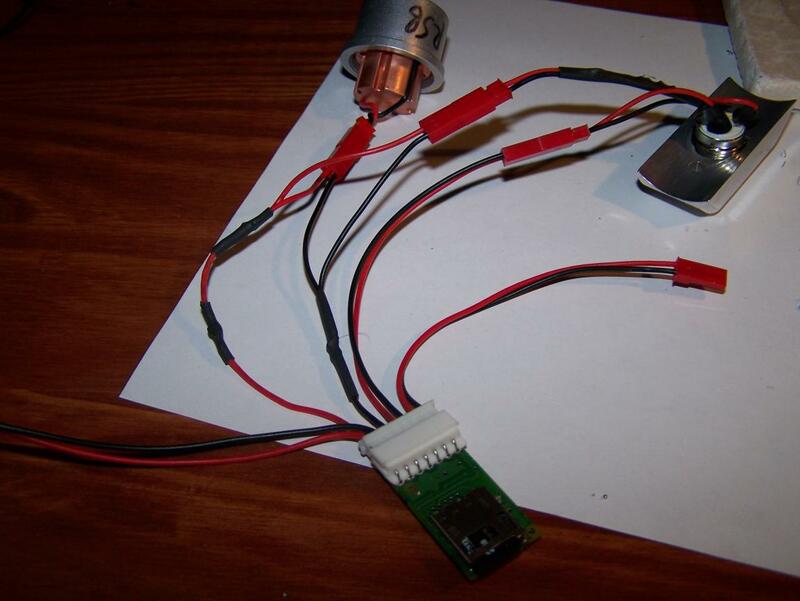 Lithium ion power supplies. Battery status LEDs. You know, bells and whistles. So you build a saber with a MHS Builder program the site has, add the parts to your wish list. Ever since I bought my house, I've been selling off a lot of my old hobbies on ebay. Mostly old WizKids Mechwarrior miniatures and old LEGO sets I really don't need. Every now and then I'll buy another part from the list. Recently, I finally picked up the last part I needed to construct my saber. I'm having a bit of bad luck trying to get the electronics working. Soldering is still new to me, so trying to melt solder onto the tiny little holes on the sound board is proving to be highly difficult. I can't get the solder to do anything but bead up, and connections are not being made. I'm having difficulty getting the momentary LED switch to work; it's constantly on instead of only turning on when it's pressed. The blade LED is doing the same thing when I have power running through the board, on those rare times I can angle the board and the pins to connect. So I'm in a bit of a slump. I can't get my electrics to work. I'm worried I killed a $70 sound board. I'm pretty sure I killed a $8 2w speaker. Who knows, maybe I didn't kill it because I can't tell without knowing if the sound board works. I've received a few more tips, and a few more words of encouragement. I'm probably about a week away from contacting a local sabersmith and dropping the parts in his lap asking to help fix it.